Get up Close & Personal with the Native Flora & Fauna of the Rainforest! The hanging bridges and hot springs tour is great for anyone who wants to get up close and personal with the native flora and fauna of the rainforest and then enjoy a soak in thermal hot springs! After a 30-minute drive from your hotel, arrive at hanging bridges set in a 250-hectare reserve of primary forest. The three-kilometer trail has 16 state-of-the-art hanging bridges that introduce you to the forest’s rich biodiversity and loop you through the mountainous area. The forest is home to many animals and birds like howler monkeys, poison dart frogs, red frogs, snakes, toucans, and parrots. This fun and informative 2.5-hour walk allows you to have close contact with the nature surrounding you and learn more about the primary forest. Next, head to the nearby Ecotermales thermal hot springs, famous for their therapeutic benefits since ancient times and well known for helping to relieve stress and tension in both the body and mind whilst detoxing the skin. 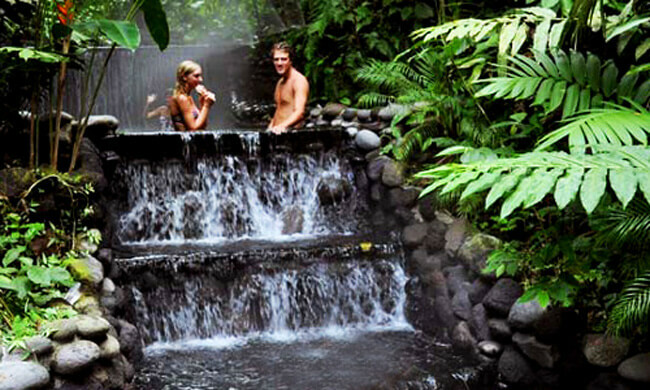 Ecotermales is the smallest of the Arenal hot springs and accepts no more than 100 visitors at a time, which is perfect for couples, families, and groups looking for a unique and authentic experience in a tranquil rainforest setting. Owned by a local Costa Rican family, Ecotermales offers four pools in total varying in temperature between 91º F and 105º F.
Spend two hours bathing in the mineral-enriched hot springs before enjoying an authentic, traditional Costa Rican meal at the Ecotermales restaurant. After your meal, you will be driven back to your hotel. Please note: The walk is a steady moderate walk, but some parts are uphill. Your tour includes: transportation from/to your hotel, entrance to the hanging bridges and hot springs, guide, dinner.